My new home in Ontario has gardens in the front and backyard. However, both are extremely overgrown and I feel overwhelmed even looking at it. Where do I even start? Though I love a pretty flower garden, I’ve never actually had my own. It’s not for the lack of desire to have one, I just really don’t know where to even begin with it! 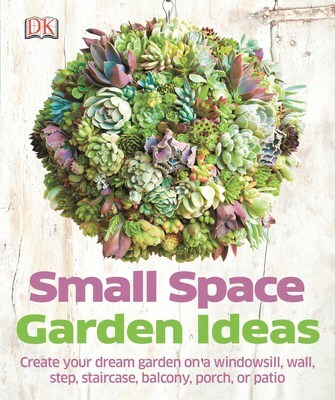 I was browsing through DK Canada’s Gardening Boutique and came across the book, Small Space Garden Ideas. I thought it would provide inspiration for the garden at my new place. After checking out the book, my head is full of little projects I want to do this summer with our outdoor space. The book is divided into sections including Micro Garden, Let It All Hang, Grow Up, Contain Yourself, Go Wild and Plant Practical. In each section, you’ll discover gardening projects geared for small spaces. Each project tells you the tools & equipment and plants you’ll need, description and the steps to make with a picture. It also has a large picture of what the finished project should look like. I’m a visual person so I appreciate the pictures of each step. For the kids, they can help make the Kids’ Miniature Barnyard Garden and learn to care for their garden as you tend to your own garden. I know Bridget would really enjoy having her own garden. Now that my unpacking is done, I’m ready to tackle the yard with a few of these gardening projects. Wish me luck! Check out the other books featured in DK Canada’s Gardening Boutique on for 30% off for a limited time only. This book looks great! I live in a small apartment and have a very small space for a garden. This book will give me great ideas for my balcony! I wish you luck as you tackle your yard. My mom always had beautiful gardens. Unfortunately, I did not inherit that from her. This book would have been perfect for when I lived in the city, with my tiny balcony. We now have a full backyard, and I’m waiting to garden until next year when my girl is a little older. Love DK, they never disappoint! Thank you! I live in a ground floor apt and have a small space for a garden. The book would be a tremedous help!! This is a wonderful book to help me garden in a small spot. I have a small area that I would love to try and grow something. I will have to check this book out. This would be perfect for us. We are going to try and do a balcony garden next year but have no idea where to start! Thanks for the review! This book looks awesome! I have a huge yard but only want to use a small space by my back door due to me being disabled. Love this! I used to live in the city and hated not having a garden…it was the one thing I missed the most. (book review | small space garden ideas) I really like all the different ideas for planting things when you have little space to do so. This is perfect! We don’t have a lot of space, and I really love to garden! I definitely need to check this book out and get some ideas. Very helpful book, we’ll get a lot of ideas for sure! Oh this would be perfect for the new place we’re moving to we have very limited space. I’d love to make a windowsill garden. This book would be great to read for avid gardeners like me. What a great resource! I’m certainly not a gardener but this book could help novices like myself create something beautiful! This is awesome, I could really use this book as I need some motivation to start gardening! This book looks good. I live in the desert and most of my gardening is in containers on the patio. Sounds like a very informative book, thanks for the Review. What a beautiful book, I love a flowers and gardens. Having a small space garden would be so much easier to maintain and yet you still get to enjoy nature. Sounds like a great book! I know someone that it would make a perfect gift for so I might just have to order one!